I'm afraid I'm going to have to be a boring blogger for awhile. The studio is humming with activity, but it's mostly TOP SECRET book stuff, so I can't share it! Meanwhile, I'm taking a break and traveling out to some national parks. 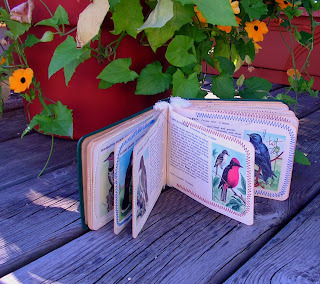 Hi Kelli: what can I say, love your art, your blog, your sharing and your publication entries I've seen recently : ) waited and waited and now here is a new post yipppeeee - thank you for sharing your little travel book, I make little board books too and truly love working on them. the wait was worth it : ) Rte 66 is WONDERFUL - Enjoy !!!!! gorgeous!! The travel journal you made it really neat. I'll bet you already know that you can now get BLACK gesso. Hi Kelli, I've only just come to your blog. I wanted to let you know that I've made one of your scrappy crows as shown in QA Issue 15. It was great fun to make, I'll definitiely be making more, and I'm giving it away on my blog. Hope that's ok - I've posted a link to your blog too. Kelli, Could you please clarify what you meant by " I was concerned about the binding, so I added a strip of muslin at each join and attached it with fabric glue." Sorry, but I couldn't see any muslin strips in your photo and I'd like to understand exactly how they were used. Great foundation travel journal!